For today I wanted to share a little something from the Emerald Isle. The first photo was made at the Cliffs of Moher on the western coast of Ireland in County Clare. It certainly illustrates why Ireland is referred to as the Emerald island. The tower is known as O’Briens Tower. 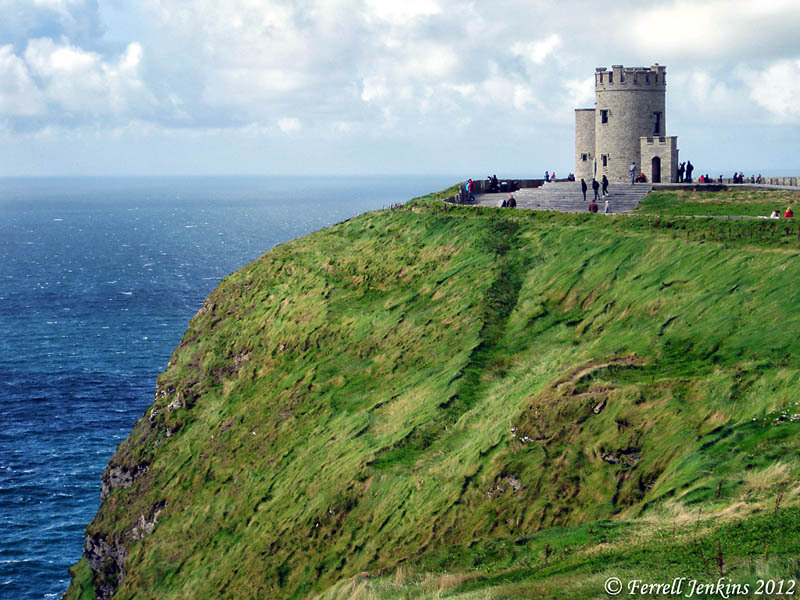 A nice web site about the Cliffs of Moher may be viewed here. At the Cliffs of Moher, western coast of Ireland. Photo by Ferrell Jenkins. 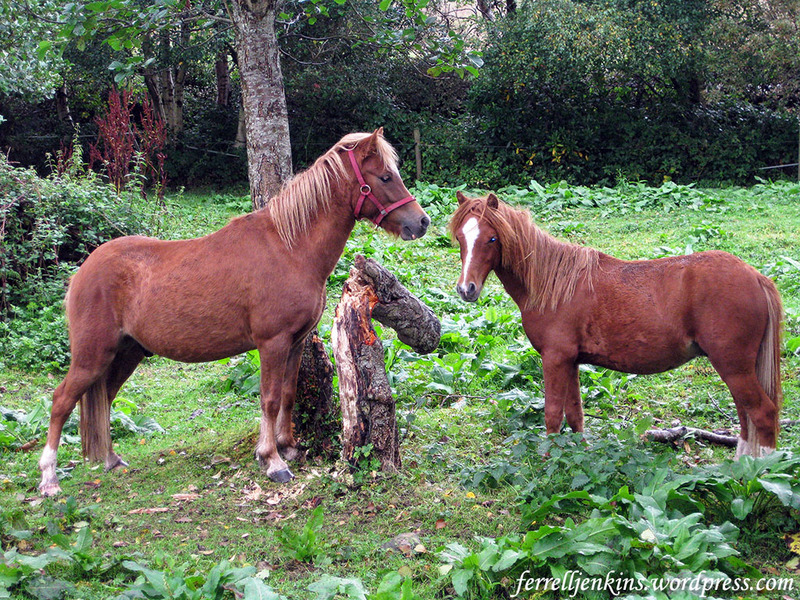 The next photo comes from Wicklow County in the south eastern corner of Ireland. Glendalough served as a Christian monastic center for about 500 years from the sixth century A.D.
One of the educational exhibits at Glendalough involves the work of the scribe in copying the Scriptures and writing ecclesiastical works. 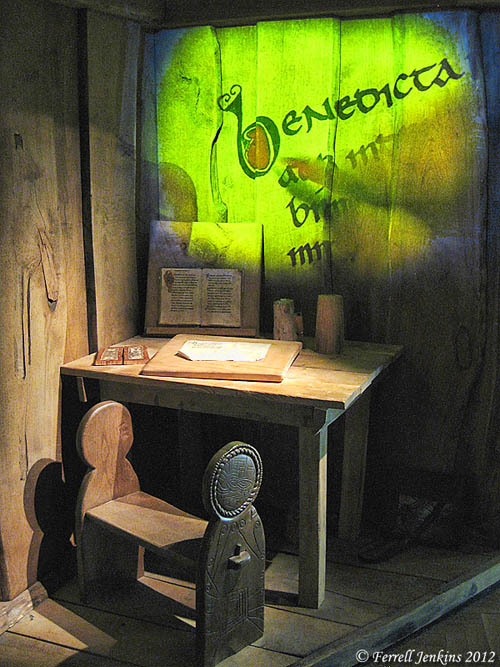 Scribe Exhibit at Glendalough, Wicklow County, Ireland. Photo by Ferrell Jenkins. 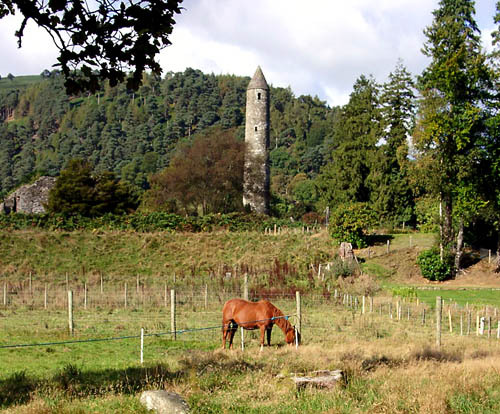 Click on Monastic Chapters from a web site about Glendalough and Wicklow County here. Many Americans have Irish backgrounds. Something Irish may be appropriate today. 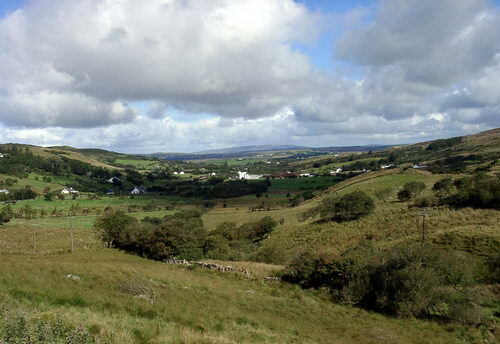 This photo of gently rolling hills of northern Ireland is typical of the northern part of Ireland. The closest large town is Armagh, but it is between Rich Hill and Ahorey. 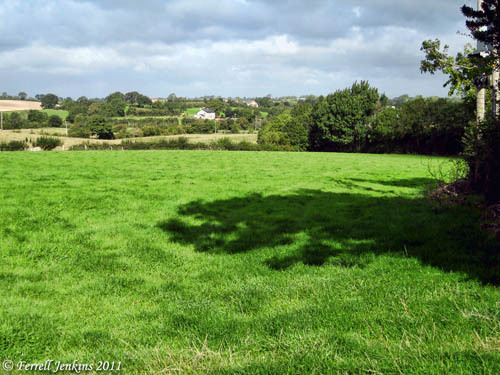 Farm land near Ahorey Church, North Ireland. Photo by Ferrell Jenkins. Students of the Restoration Movement will recognize this area as the home of Thomas and Alexander Campbell in the early 1800s, prior to their departure for America. 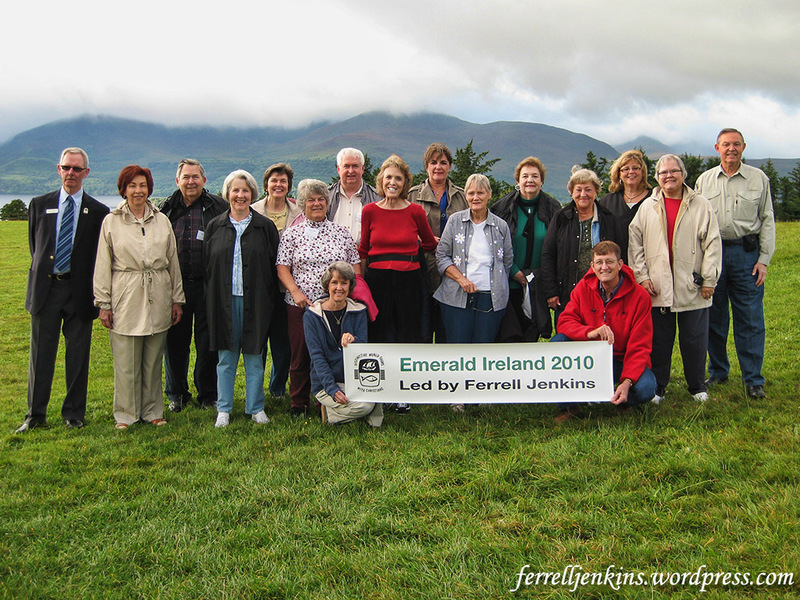 Some time I would like to post several photos of Irish sites associated with the Campbells. 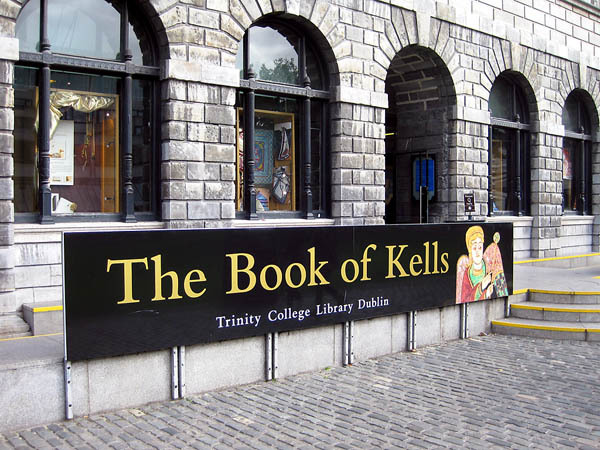 Last week I visited the Trinity College Library in Dublin, Ireland, to take another look at the Book of Kells which dates to about A.D. 800. Entrance to Trinity College Library and the Book of Kells. Photo by Ferrell Jenkins. Two volumes of the famous illuminated Gospels in Latin were on display in a special case. One showed the first words of Luke 4. Two full pages were used for these words and the associated drawings. Another volume was open to John 7:31-40. The Book of Kells is famous for its drawings showing the The Four Evangelists, that is, the four writers of the Gospels (Matthew, Mark, Luke, and John). Souvenirs may be seen in shops throughout Ireland with these images imprinted on them. 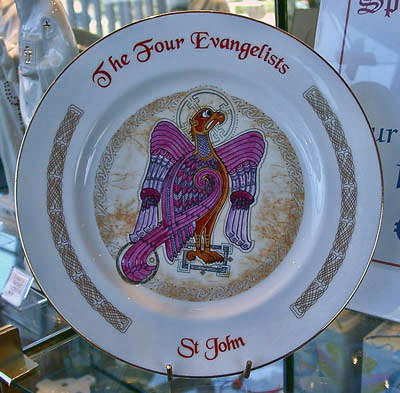 Here is a plate depicting John as an eagle. John as an Eagle. Photo by Ferrell Jenkins. In A.D. 597 Saint Columba went from Ireland to Iona, an island near the coast of Scotland, to teach Christianity. The famous Book of Kells, an illuminated Gospels, was likely prepared by the monks of Iona about A.D. 800. It is not certain that anything remains on the island of Iona from the time of Columba, but there are numerous medieval ruins. Here is a photo I made a couple of years on the island. 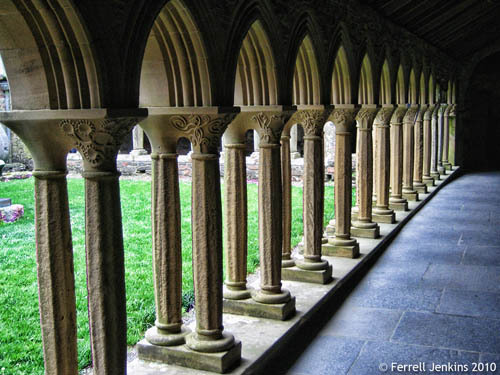 Columns on the Isle of Iona, Scotland. Photo by Ferrell Jenkins. Eventually the Book of Kells was brought to the Abbey of Kells, a monastery that had been founded by Columba, about 40 miles north of Dublin. Trinity College was founded in in 1592 under a charter of Queen Elizabeth. The oldest remaining buildings date to the early 1700s. Visitors are allowed to visit the Long Room of the Old Library. This room, almost 200 feet long, is impressive to anyone who loves books. 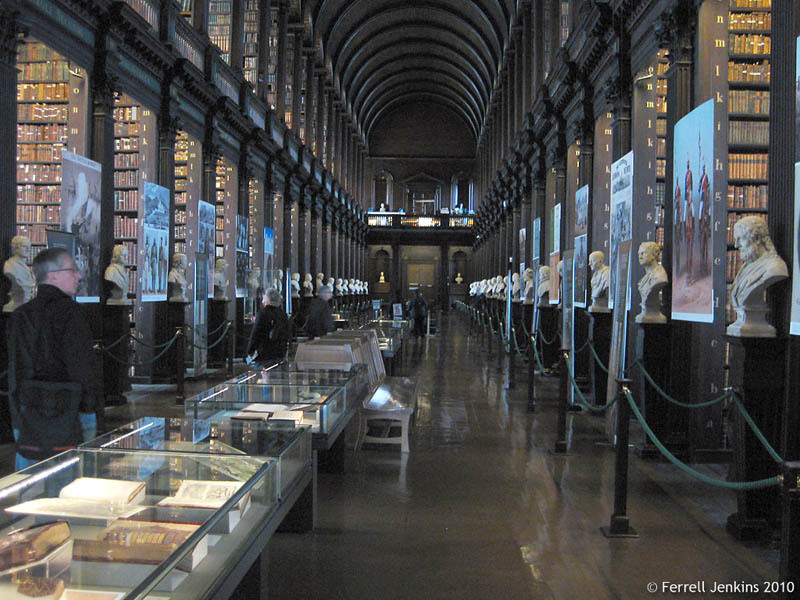 The Long Room of Trinity College Library. Photo by Ferrell Jenkins. We are taking a little break from the usual Bible World photos to enjoy a couple of pastoral scenes from the beautiful Emerald Isle. Glendalough, Ireland. Photo by Ferrell Jenkins. Pastoral scene at Glendalough, Ireland. Photo by Ferrell Jenkins. Thomas Moore (1779-1852) is known as one of Ireland’s best writers. 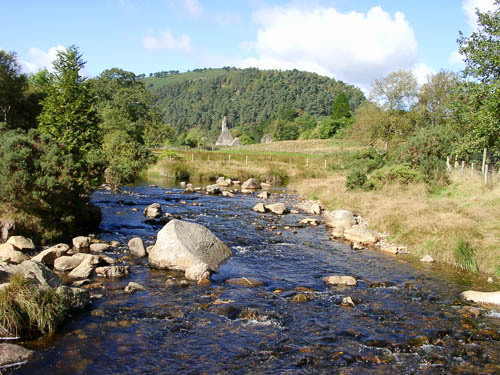 A little south of Dublin, in Wicklow County, the Avonmore and Avonberg rivers meet. Moore made this spot famous in his poem The Meeting of the Waters. Where the Sweet Waters Meet. Photo by Ferrell Jenkins. How fortunate is any person to have a special place to recall as a place of peace. I have enjoyed several of these places through the years. First, there is home. My study, when my desk is clean and it’s raining outside, is another. I think also of the Sea of Galilee at sunrise, or sunset. Spiritually we find peace in Christ. Thoughts turn toward the Emerald Isle on St. Patrick’s Day, especially for those with Irish roots. The truth about St. Patrick is shrouded in Irish mist. He is said to have brought Christianity to Ireland, perhaps in the latter part of the fifth century. I do not celebrate St. Patrick’s day, but for whatever good he may have done I am thankful. I thought this would be a good opportunity to share a photo from Ireland with you. Ireland is a beautiful place to visit. The photo below of Finn Valley was made near Donegal Bay. The area is noted for beautiful hills, a magnificent coastline, majestic mountains, deep glens, and shimmering lakes. 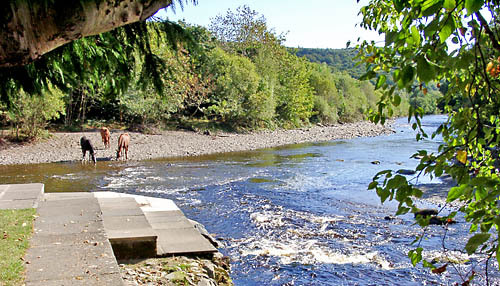 Ireland's Finn Valley. Photo by Ferrell Jenkins. One branch of my family came from County Wicklow on the south eastern side of the island.